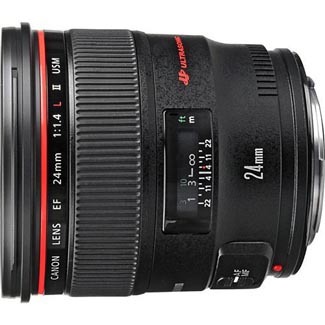 The Canon EF 24mm f/1.4L II USM Lens is a high quality wide angle prime that corrects for distortion, making it ideal for landscapes, photojournalism, and interiors. It can be paired with both full frame sensor cameras, such as the Canon 5D Mark III, and with crop frame sensor cameras, such as the Canon 7D Mark II. The focal length equivalent on crop frame sensors is 38.4mm (a great length for street photography). This lens is considered among many Canon shooters as a definitive wide prime lens, along with the Canon EF 35mm f/1.4L II USM Lens. Both are well suited for group portraits at events, such as weddings and graduations.